It’s getting warmer every day. How are you? I’m pretty fine except that my nose’s been itching badly. I have hay fever. If you have hay fever, you are allergic to pollen. 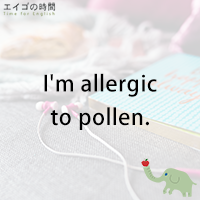 Pollen is a fine powder from trees and grasses. Throughout the spring months, I check pollen count every day, wear a surgical mask when I go out, make sure to have half a dozen nasal sprays in stock. Such a pain in the neck. Now, people can be allergic to different things. There are food allergies, for example. You may be allergic to milk, eggs, wheat, soy, or shellfish. Actually, I’m allergic to shrimp. Other than food, you may be allergic to metals, chemicals, sunlight or even cats. Well, I hope you’re not allergic to English and are ready to learn this expression “to be allergic to something”. I am (I’m) allergic to pollen.